NileCAM - a new camera series with Gigabit Multimedia Serial Link (GMSL) serializer and deserializer (SerDes) technology. The NileCAM series cameras are SerDes cameras which can be used for longer distance. These cameras can be placed 15 meters away from host processor through coaxial cable and still to support less latency and high frame rate. It's the world's first fastest GMSL camera. NileCAM30 is a first GMSL camera in the NileCAM camera series. NileCAM30 is a two board solution containing the camera module and serializer board. This camera is based on AR0330 CMOS image sensor from ON Semiconductor®. The NileCAM30 comes with 3 meters or 15 meters coaxial cable with FAKRA connector. NileCAM30_USB is a 3.4 MP GMSL Camera for USB3.1 Gen1. NileCAM30_USB is a four board solution containing the camera module, serializer, deserializer and USB baseboard. 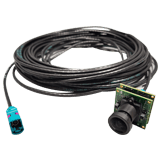 This camera is based on AR0330 image sensor from ON Semiconductor®. 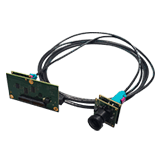 The NileCAM30_USB comes with 15 meters coaxial cable with FAKRA connector. 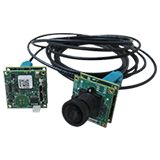 NileCAM30_TX2 is a 3.4 MP MIPI GMSL Camera for NVIDIA Jetson TX2/TX1. NileCAM30_TX2 is a four board solution containing the camera module, serializer, deserializer and TX2/TX1 base board. This camera is based on AR0330 CMOS image sensor from ON Semiconductor®. The NileCAM30_TX2 comes with 3Mtrs/15Mtrs coaxial cable.